Going somewhere? Our summer arrivals are bound to become your go-to’s for wherever the sun takes you. 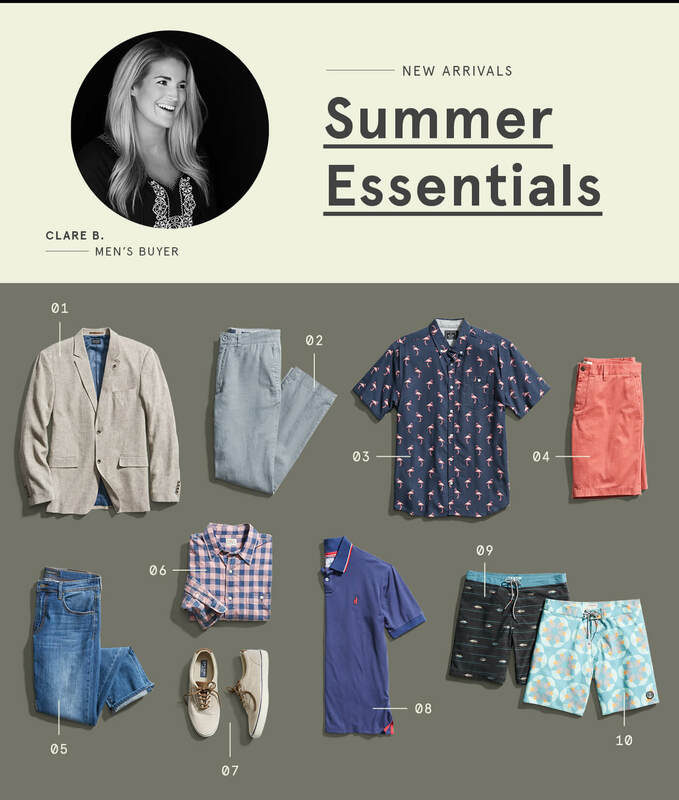 To keep your look fresh and vacation-ready, Men’s Buyer and Stylist Clare B. is handpicking the 10 staples every guy needs for a stylish summer. Feeling a new look? Ask your Stylist to include it in your next Fix. Clare―let’s roll with the new! Summer doesn’t mean sloppy or only dressing for the beach. A light, linen blazer perfectly pairs with jeans or dressed up with a poplin shirt for a summer wedding. Whether it’s a meeting in the office or a day in the park, neutral khakis are great for making that seamless transition from work to weekend. Party over here. A fun print isn’t just a convo starter, it’s the most modern way to channel summer vibes. This is your perfect versatile short. The fabric is insanely soft and the pop of color adds something different! Shelve your dark denim for lighter (and cooler) washes. Just don’t go stone wash.
It’s a laid-back pattern everyone can wear in a color combo they may not have. Not your basic sneaker. I love Sperry’s take on a classic with texture and leather laces. Stay chill with a polo that’s built above the rest. This elevated style has sun protection to block out rays and moisture-wicking technology to reduce sweating. Like any of the styles featured above? Ask your Stylist to add similar items to your next Fix.